It’s been raining here in Connecticut for what feels like a decade, and it’s still muggy and warm. Where are you, Fall weather? We are ready to take out our big sweaters and take a walk through the colorful + crunchy leaves, collecting all the best ones as we go. 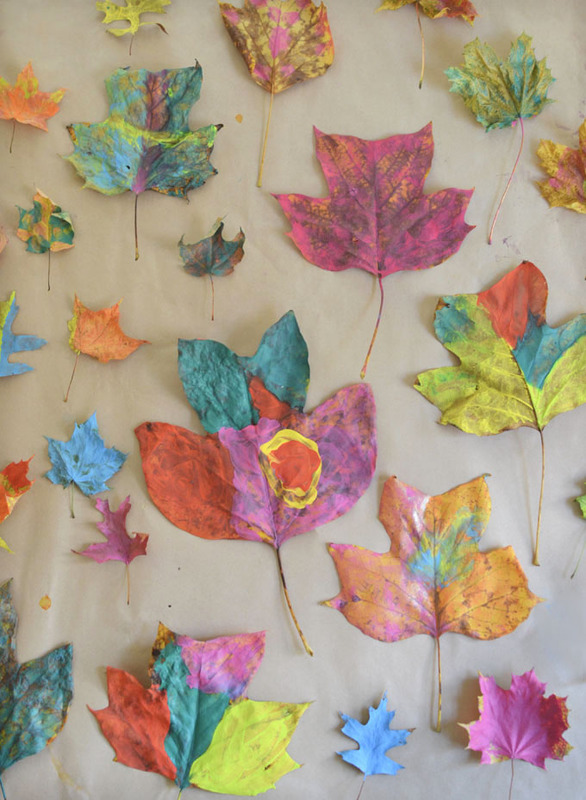 This leaf painting with kids activity is something I do every year with my students. These photos are from a few years ago when we had a tulip tree in the yard. 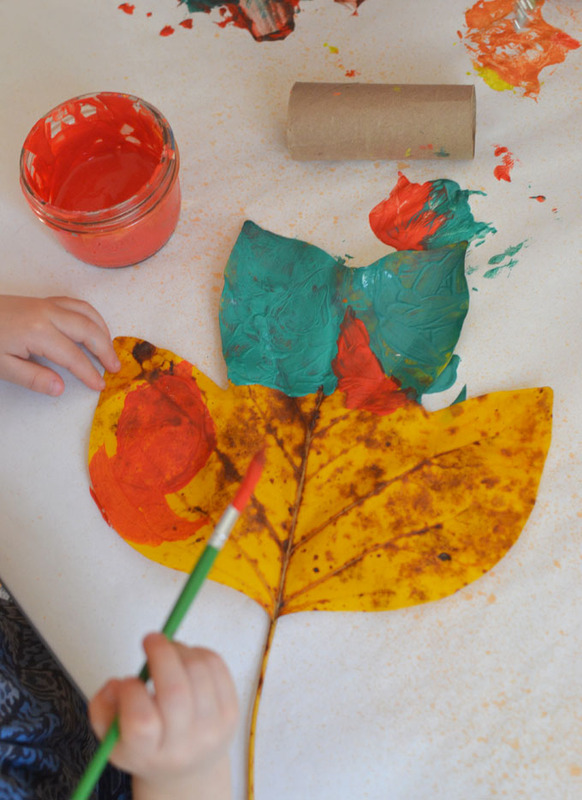 Giant tulip tree leaves are the BEST for painting! The way I paint leaves with a group is very open-ended. 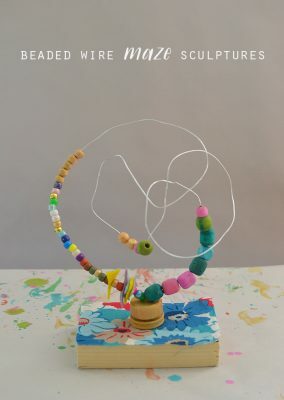 It’s much more of a process art experience than something crafty. No directions, anything goes. 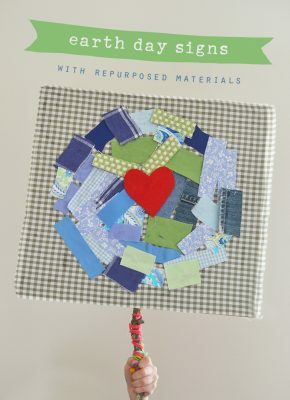 Here are the supplies I take out and how I set up the table for a multi-age group of kids. 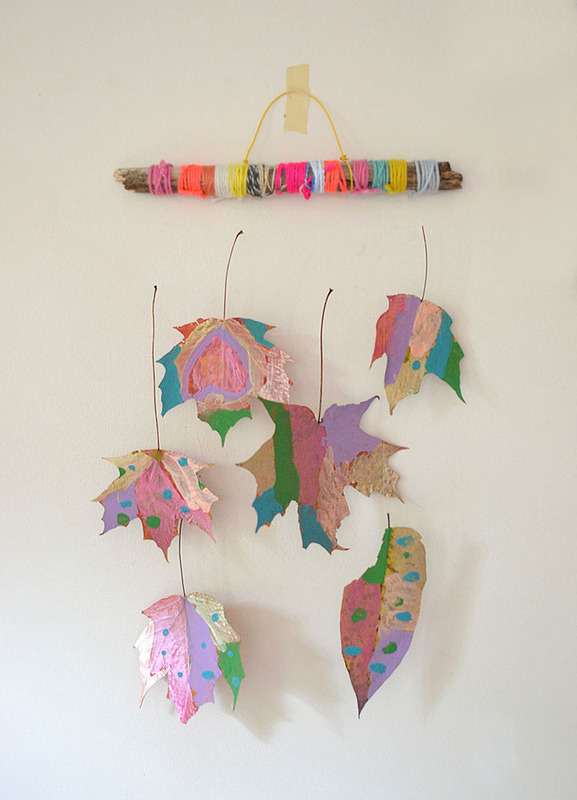 ~ A various assortment of odds and ends to encourage exploration with leaves and on the paper, such as stencils and plastic embroidery mesh. 1. Get outside and collect some leaves. Depending on how much time you have, you can either do this before the kids arrive, or with them. 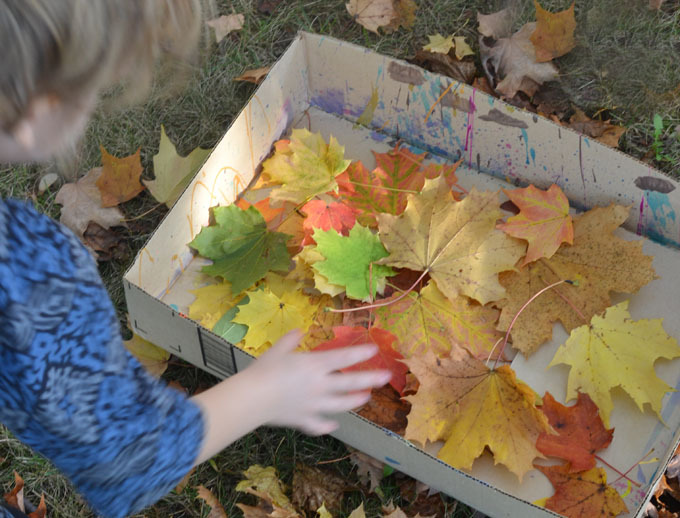 We use a shallow box to collect the leaves. 2. 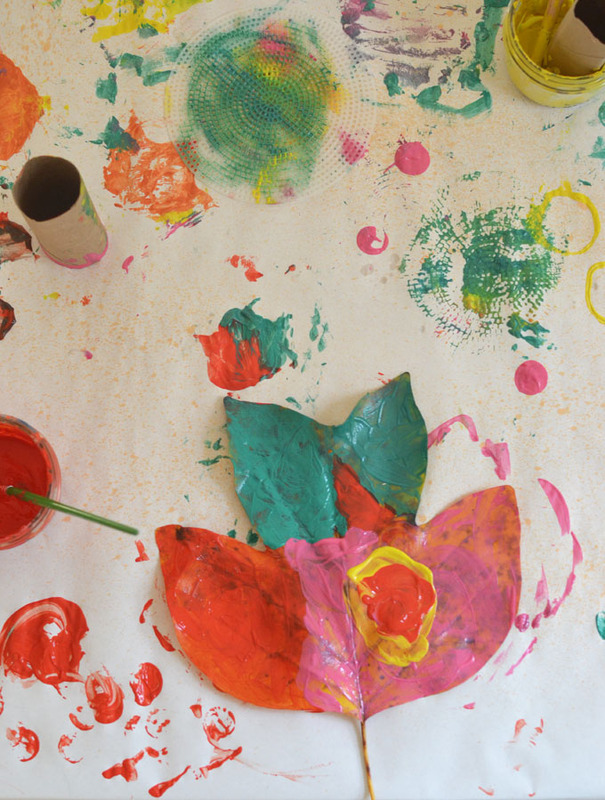 Cover the table with paper, and set out a slew of bright colors. I like to mix my colors with white so that they are more opaque and cover the leaf color better. 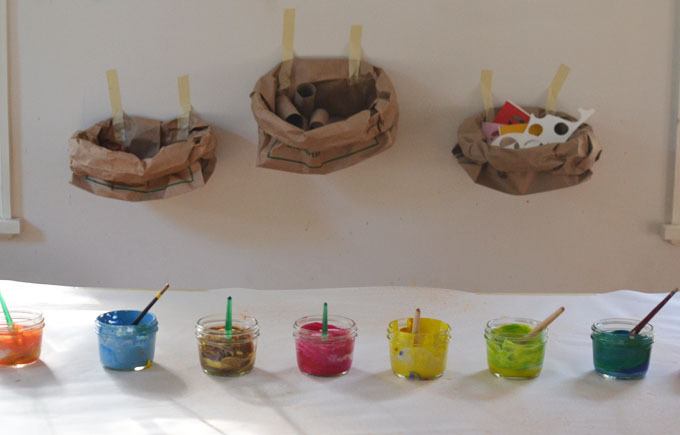 Set out a bunch of materials that the kids can use to paint with on the paper. This time I hung them in bags behind where they were working. 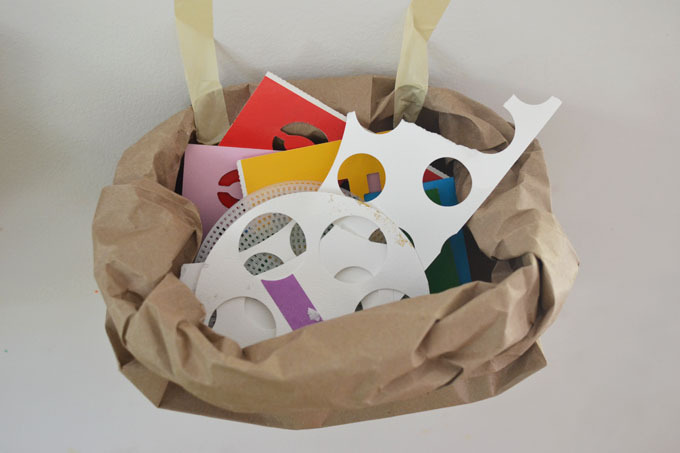 One bag had the leaves, another bag had toilet rolls and corks, and the third bag (pictured above) had stencils. 3. Let the kids paint! They were allowed to do anything they desired. 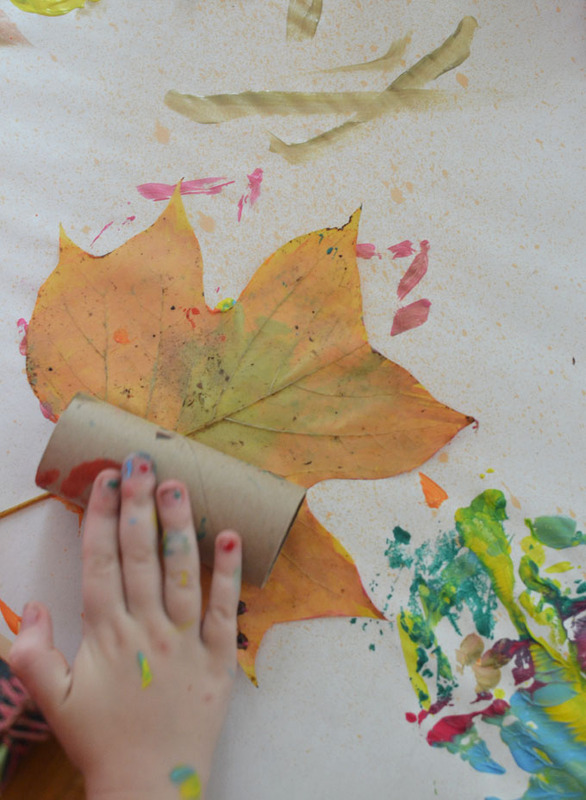 Some wanted to paint the leaves then turn them upside down to print on the paper. Others just wanted to save theirs. We put them on some newspaper to dry. 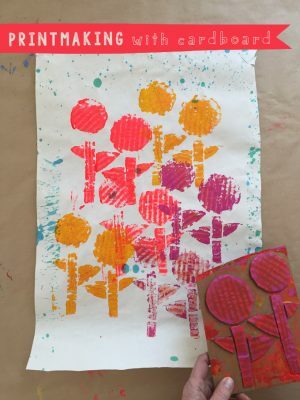 And still others weren’t interested in leaves and just wanted to print dots and splatter the paint. As long as they don’t splatter paint on other people, they are allowed to follow their curiosity. 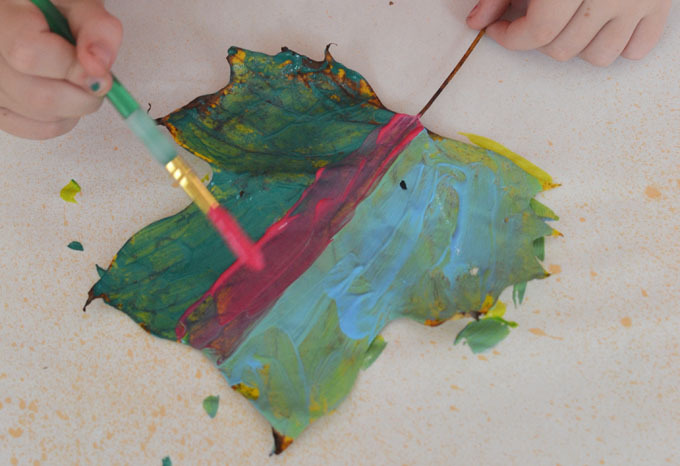 Tulip tree leaves are gigantic and so fun to paint! And I love the warm, yellow hue underneath. This leaf right here is such a beauty. 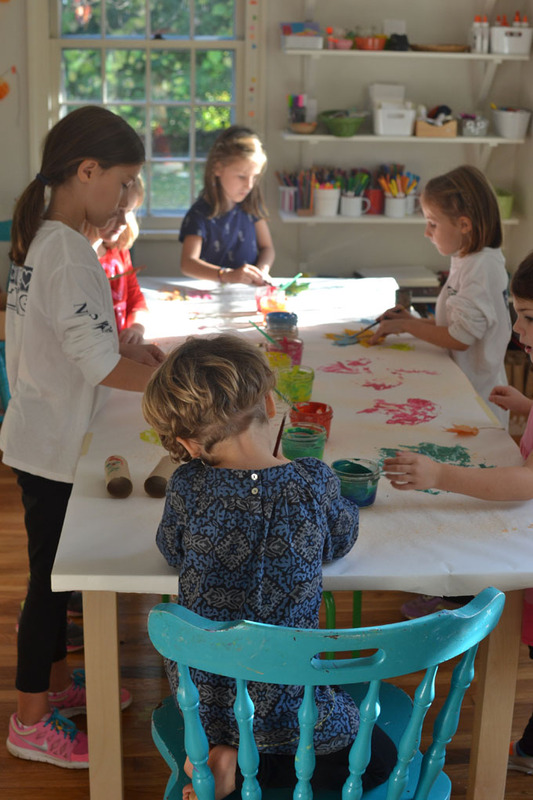 I’ve said it before, but I get so inspired watching children paint because they have an enviable and innate sense of design and color. That yellow and red circle off to the side makes the leaf look modern and graphic. After the leaves dry, they do curl. Place them in between some books to flatten them back out. Wonderful ideas! 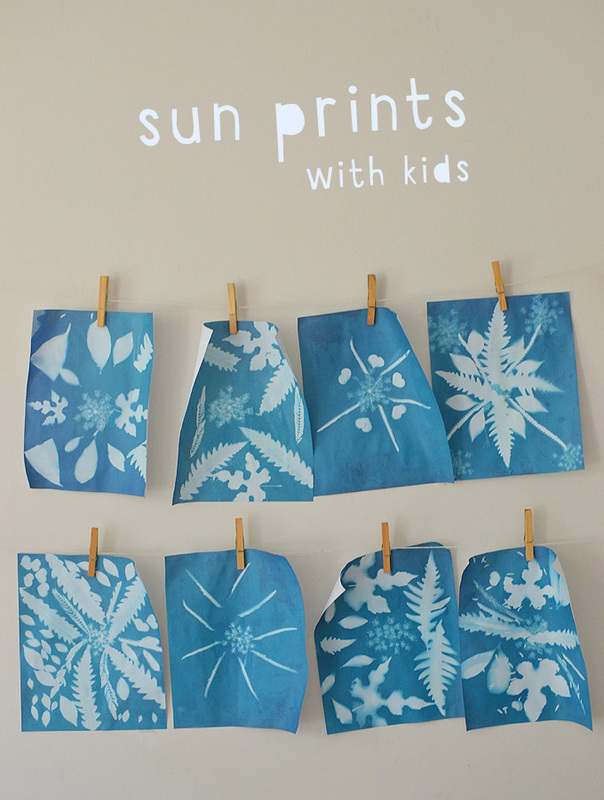 Can’t wait to do it with my kids this weekend. 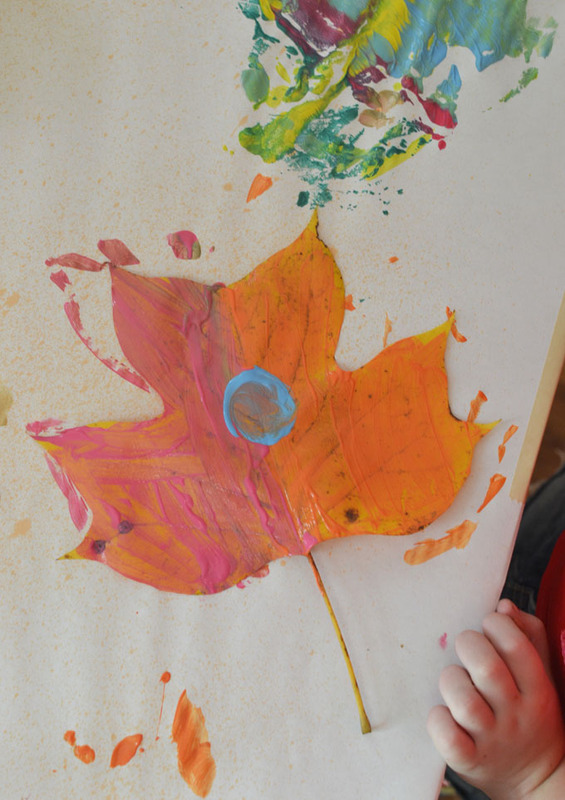 My grandkids loved the leaf panting!!! Creativity starts at an early age. What you are doing is fabulous. I have a very large tulip tree in my back yard and when it’s Fall it usually means cleaning the house gutters. 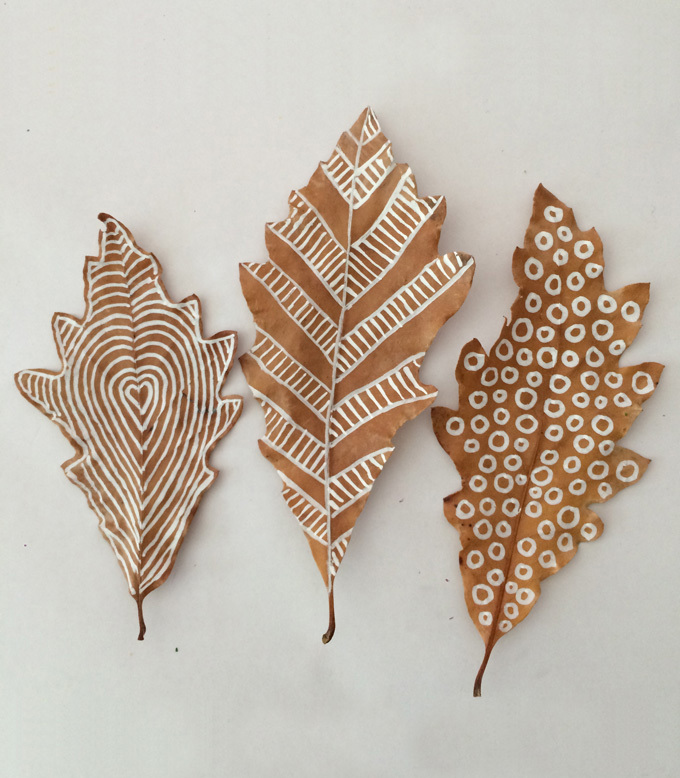 You use of leaves is brilliant! Yes! 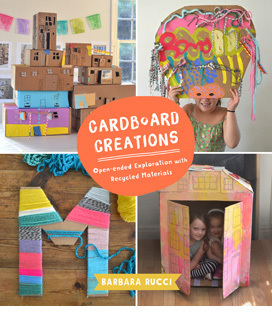 I want to raise thoughtful and creative children. Send me more inspiration, please! All content on this blog is copyright and owned by Art Bar Blog unless otherise stated. I would be flattered if you wanted to use an image from one of my posts! But please, ask me first. I would also ask that if it involves DIY instructions with a list of supplies that you don't repost any of that stuff because then nobody would have a reason to click back to my original post! Subscribe to my weekly (ish) newsletter and receive a list of the best art ideas every Saturday. Art matters!